PowerLine adapters are not a frequent guest at our test lab. 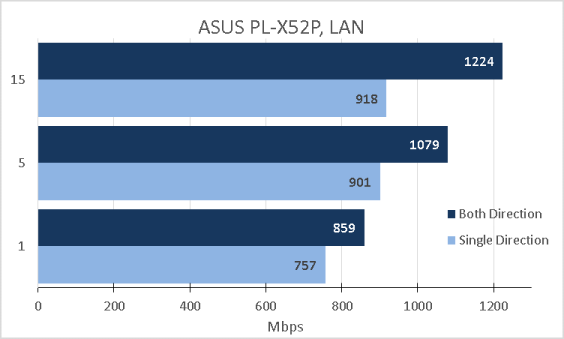 We already reviewed ASUS PL-X32M model with the maximum throughput of 200 Mbps and D-Link DHP-500AV with the maximum theoretically possible throughput of 500 Mbps. The latter model went on sale about a year ago. 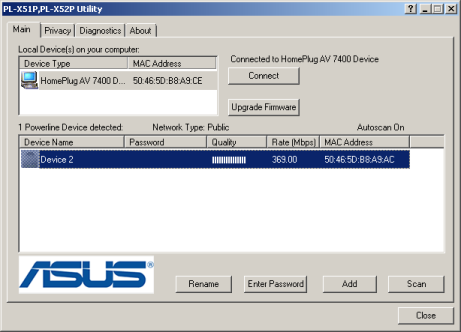 Around this time ASUS PL-X52P two-adapter pack was released too, but it reached our lab just recently. 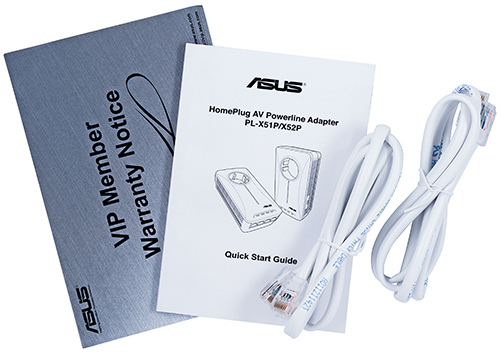 To conclude the introductory part of the review, we would like to point out that ASUS also produces PL-X51P model which features just one adapter. The maximum theoretically possible throughput of PL-X51P/PL-X52P models is 500 Mbps. 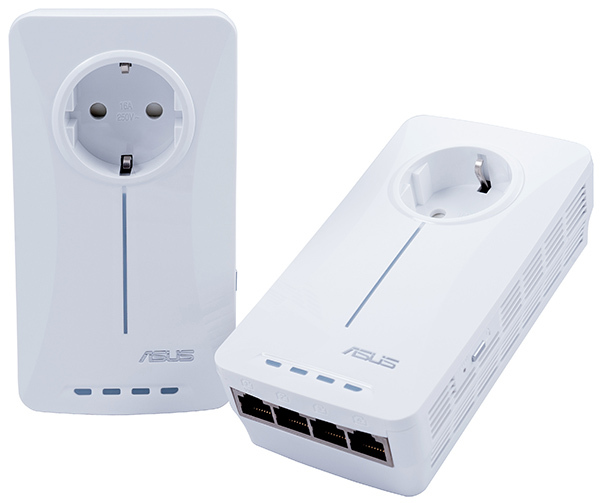 ASUS PL-X51P/PL-X52P PowerLine network adapters come in white plastic cases with dimensions of 140x75x43 mm (not considering the plug). The full case dimensions are 140х75х81 mm. A key distinguishing feature of the model under review from all other counterparts we had previously seen is a power outlet located on the front device side. 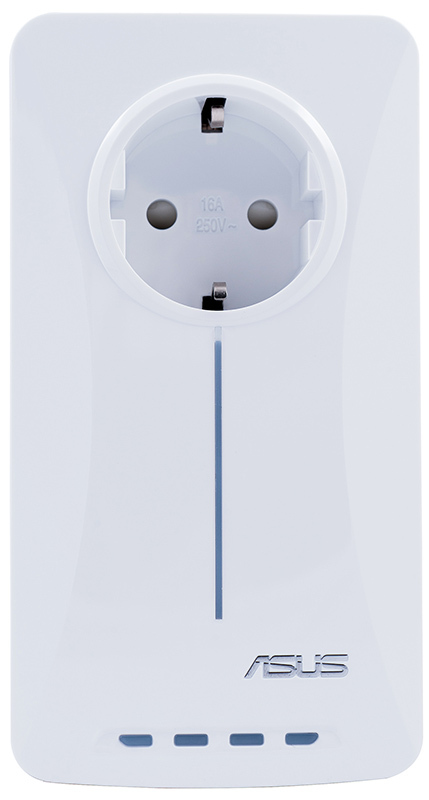 The above-mentioned outlet can be used for connection of an extra load customer with the overall electric capacity of no more than 3.5 kW. There is a low-pass filter installed between the plug and outlet on PL-X51P/PL-X52P case; actually, it's just two inductance coils that are clearly seen on one of the photos in this section of the review. Also, there are LEDs indicating the status of four Gigabit Ethernet ports, brand tag, and LED indicating the device operation located over here. The upper panel is not remarkable at all (in case you plug in the adapter on a vertical wall). On the bottom panel of the device there are four network interfaces. One of them has more priority and is marked with VIP letters. The largest part of the side panels are ventilation grates and one of them has two buttons located on it: Reset and setting up a PowerLine network. On the rear panel of the case there are a plug used to connect the adapted to the power system and sticker with brief information about the device. Now let's have a look at the insides of the case. 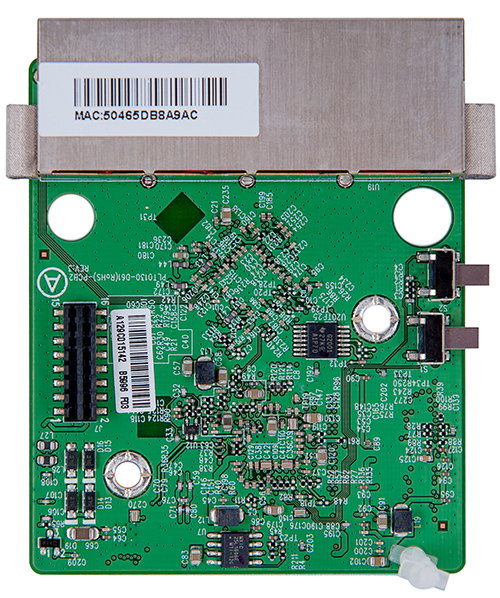 The hardware platform of ASUS PL-X52P is two green textolite cards, one of which performs only power system support functions. 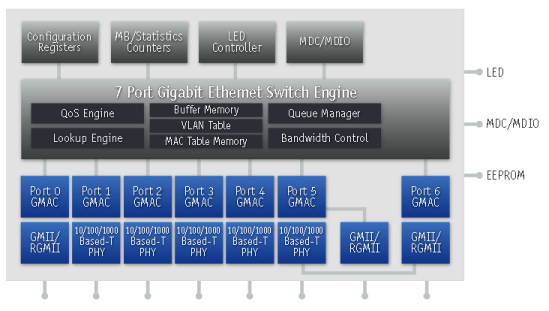 Gigabit Ethernet Atheros AR8327-AL1 switch is located on the other card. Its flow chart is presented below. 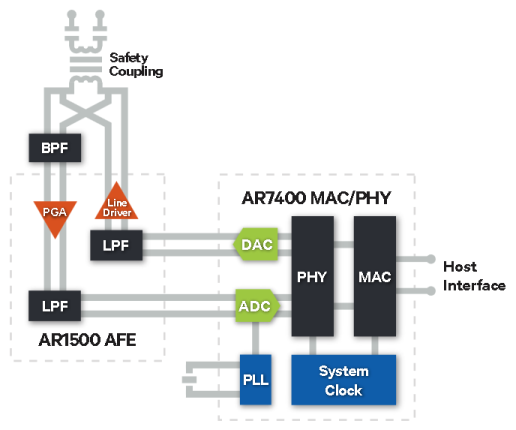 Power system support is carried out by Qualcomm/Atheros AR1500-AL1C and AR7400-AC2C chips, whose flow chart is presented below. 16 Mbyte EtronTech EM6A9160TSA module acts as the RAM. It functions within 200 MHz frequency and makes it possible to transfer data with the maximum speed of 400 Mbps. 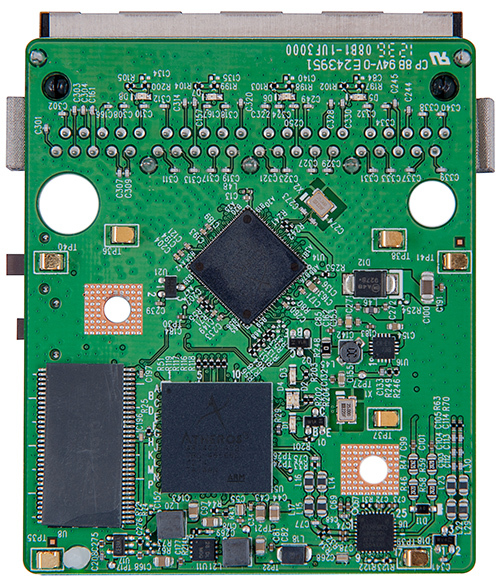 That is where we bring review of the hardware stuffing of the adapters to a conclusion and pass on to examining the capabilities of software that comes together in the box. 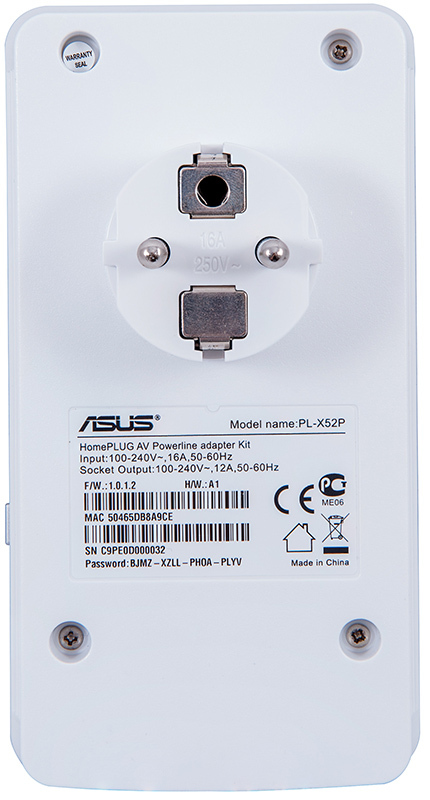 To control ASUS PL-X51P/PL-X52P PowerLine adapters one will need to use a special-purpose utility that comes together with the device on a disc. 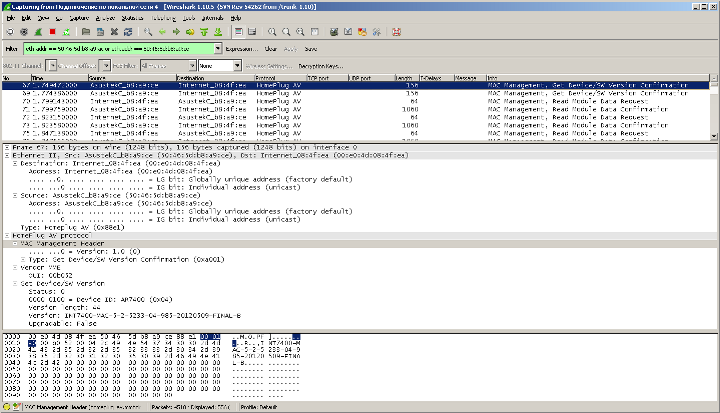 The user will need to install WinPcap utility, any version beginning from 4.1.2, in order to have PL-X51P,PL-X52P Utility working in a correct way. We installed version 4.1.3 which, unfortunately, couldn't be identified by the system. We had to delete the current WinPcap version manually and agree to install version 4.1.2. 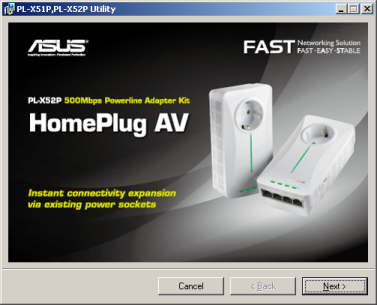 PL-X51P,PL-X52P utility lets the user detect PowerLine adapters within the local network and adjust their settings. 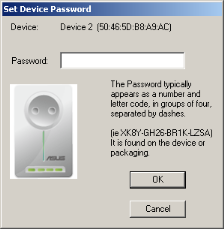 That's how, for example, the administrator can add a new device, set a password, or upgrade the firmware (if there is a newer version on the vendor's website) in Main tab. 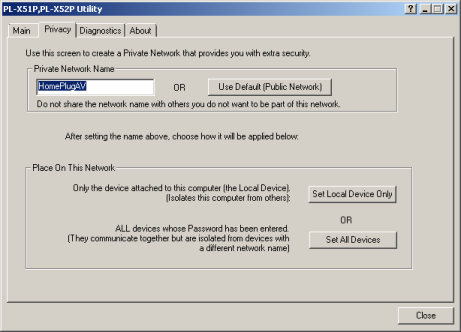 PowerLine private network name can be assigned in Privacy tab. In case there are certain problems appearing upon adapter connection, one should use Diagnostics tab. Brief information about the utility is located in About tab. Now let's skip directly on to testing the adapters. The first thing we decided to begin our testing with is interception of the traffic that controls the adapters. 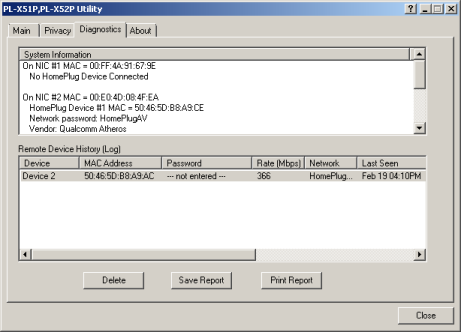 IP is not used for connection to the devices. 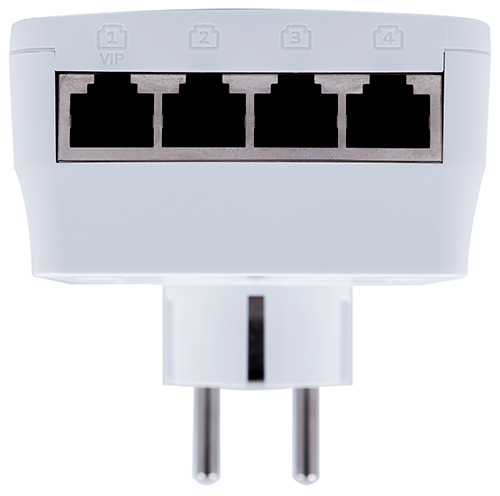 Instead of this, HomePlug AV protocol is directly encapsulated in Ethernet. The devices boot almost instantaneously and therefore we haven't measured their booting time, whilst due to their absence of an IP address we also had to opt out of carrying out security tests, which we previously performed using Positive Technologies XSpider utility. Before getting down to performance tests of the models under review we decided to provide our readers with information about the equipment used during tests. The primary specifications of our test stand are presented below. PowerLine adapters we are currently testing have a four-port Gigabit Ethernet switch. We decided to start with testing its performance. In order to do this we connected a test notebook to one of its ports and a PC to the other one. 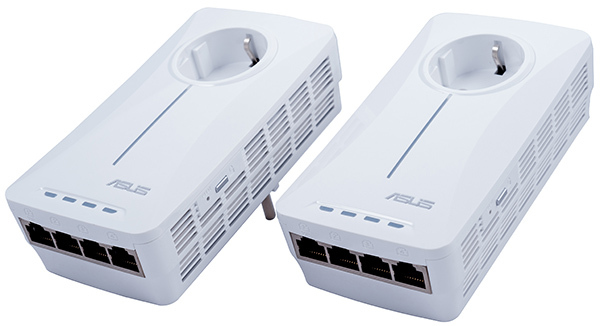 After that we successively connected ASUS PL-X52P to sockets located at the distance of one and eight metres away from one another. 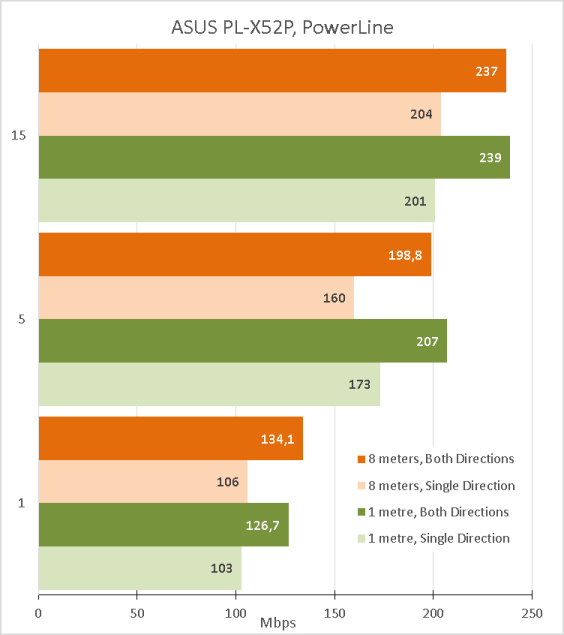 Results of the speed measurements are presented on the diagram below. 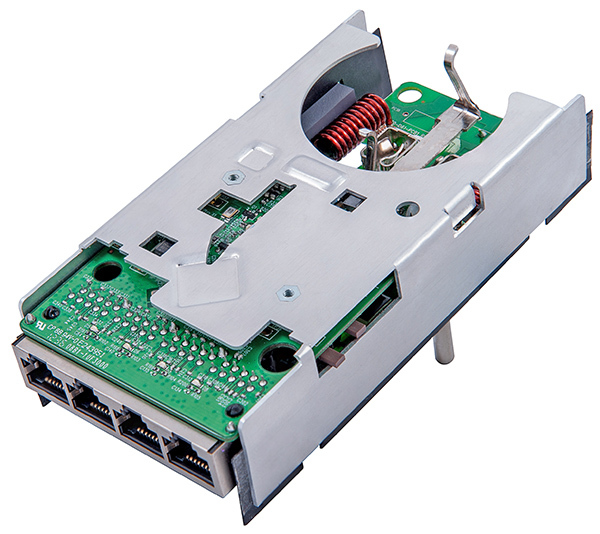 Speeds at the distance of eight metres that are a bit higher can be easily explained since things that affect the testing results include not only the cabling condition, but also presence of interference caused by various equipment connected to the power system. More to it, the speed difference in certain tests is negligibly low and can be considered as a measuring inaccuracy. Unfortunately, we did not have a more or less uniform electrical line in order to establish an impact of the distance on the maximum transfer speed. That's where we draw the small testing chapter to a close and move on to summing it all up. 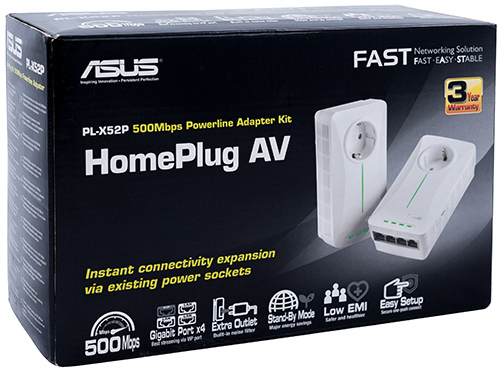 Generally, we are glad about the ASUS PL-X52P PowerLine adapters, which make it possible to transfer data via a power system at speeds higher than 200 Mpbs in case the distance between the connected devices is short, that we tested. The models under review will be a great fit in situations when one needs to consolidate several nodes into a uniform network without laid twisted pair, whilst usage of wireless technologies is either impossible or significantly limited. The strength areas of ASUS PL-X51P and PL-X52P are presented below. As of when this article was being written, the average price for an ASUS PL-X51P adapter in Moscow online shops was 2600 roubles. In the meantime, PL-X52P pack was priced at 5200 roubles.